This week we've been celebrating DeAnna Julie Dodson's new release of The Key in the Attic: An Annie's Attic Mystery. As such, each day has revealed a bit more about DeAnna, and her books in this series. Since Friday is our usual Self-Help day, I thought it appropriate to tell you about two favorite things of DeAnna's that help her unwind after a busy day or deadline. Or rather, I'll talk about one of her favorite things and we'll see if you can guess the second. Hint - they're both shown in today's header. I first discovered DeAnna's love of needlework when she appeared on my Author Memories blog with the post, Grandmama's Mirror. 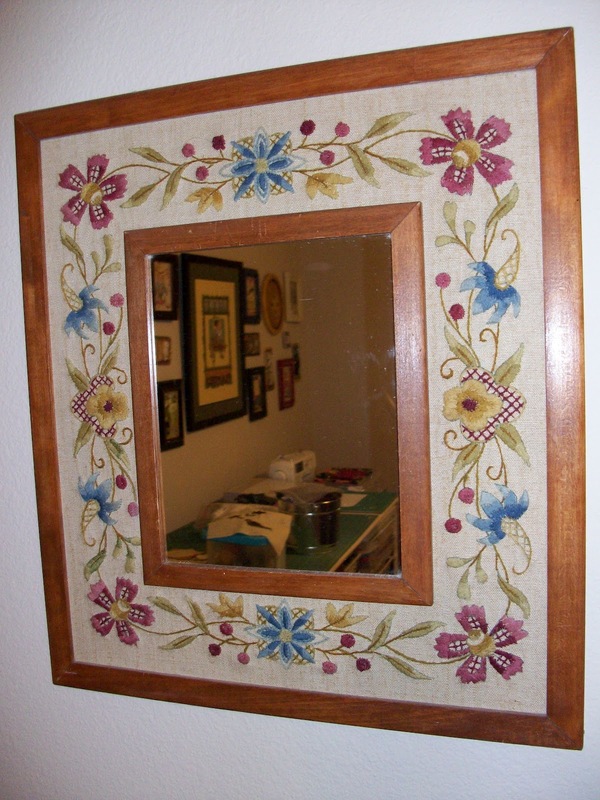 Although the mirror was nice, it was the crewel embroidery crafted by DeAnna's grandmama circa late 40's to early 50's which made the mirror special. Hint - look in the mirror. Talking about her grandmama, DeAnna said, "Besides her crochet and embroidery, she made dozens and dozens of quilts, though those were "working quilts," made to be used. Like my little doll dresses, they were loved out of existence long ago..."
It's easy to see where DeAnna got her love of needlecrafts - she was born with it. 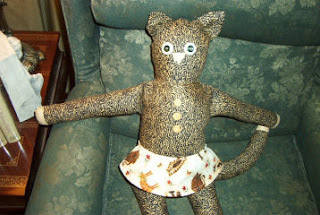 As a needlecrafter myself, as soon as I saw DeAnna's post, I zipped over to her website. I wasn't disappointed. On her FUN page, she lists several things that make her smile including, Quilting and Cross Stitching. Answer #1 - Yes, quilting is the first answer. Can you guess the second? The following quilts photos are taken from DeAnna's website Fun Page, but they're not how you see them displayed on her site. Instead, I've cropped them down to show you part of them since I want you all to go over and see the wonderful completed designs for yourself. I apologize for the loss of detail in the photos. 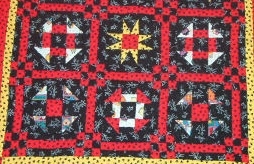 This red and black quilt was DeAnna's first attempt back in 2004. I think she did great. Hint: DeAnna says, "It is now a favorite napping place for Emily, Elliot, Eloise and Elizabeth." DeAnna created the above Christmas pattern as opposed to using a kit for this, her second quilt. Hint: DeAnna calls it, "Purrfect Christmas." 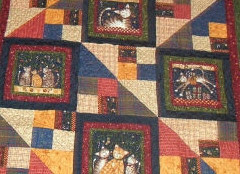 DeAnna's Catfish quilt is very unique since the fish are catching the cats using mice for bait, but you have to look close. Hint: I don't think the catfish are one of DeAnna's favorites. However, she's from Texas, so I could be wrong. 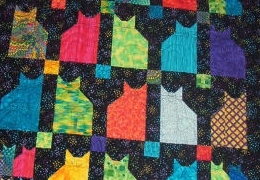 DeAnna says, "This colorful quilt was designed, pieced and machine quilted by myself." 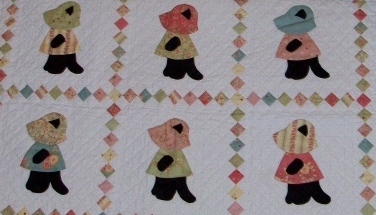 Her website gives credit to the person(s) who did the quilting on those she didn't do herself. Hint: The name says it all. DeAnna and her sister called this Elizabethan cat print, Katarina. Hint: Katarina in this case is not the hurricane. I have to admit, when I was cross stitching SunBonnet Sues, I never thought a cat could be hiding under the bonnets. 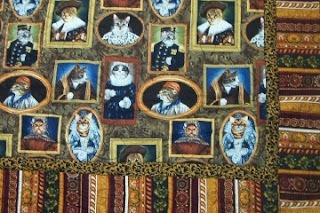 Hint: DeAnna has a black one who likes the kitty in this quilt. I think DeAnna's quilting is something wonderful to see. She gives away many of her quilts as gifts or donations and even has a Writing quilt. About her grandmama's legacy, DeAnna said this when she visited Author Memories, "Dad tells me she would be delighted to know that I'm a quilter, cross-stitcher and embroiderer, too, and am rarely without some kind of sewing project going. I try to make her proud." Brava, DeAnna. I can tell, and I'm sure she's smiling down at you. DeAnna's new release is from the series, Annie's Attic Mysteries where the each book combines the love of crafting in every entertaining mystery. Question: Do you like reading books where a location, event or craft plays the role of a character because it's so ingrained in the story? Although the Annie's Attic Mysteries is set up for a subscription to the series, if you'd like to buy just Letters in the Attic or The Key in the Attic, (both written by DeAnna Julie Dodson) you can contact Customer Service at (800)282-6643 8 a.m. - 7 p.m. [CST] Mon. - Fri.) or e-mail them at customer_service@anniesmysteries.com. I hate to say it but I don't recall seeing the cat patterns in quilting before. Granted I love quilts and making them, but I am obviously a novice in all that's out there. Cute way to combine your interests! Thanks Anita and DeAnna. i like to embroider and crochet - not that i seem to ever get anywhere with the little projects though. *sigh* i think i dabble in too many hobbies. i love doing creative, crafty stuff. i love reading books where the location or craft becomes a character - it adds an extra dimension - plus i tend to learn something new. Debra, I know exactly what you mean. I started a baby quilt when I was carrying Jessica. But I almost lost her in my high-risk pregancy, so the doctor put me on 90% bed-rest which precluded my going down into my basement to sew. That quilt is still waiting. The applique landscape is done, but I was working on the surrounding letters when I stopped. Still, it wouldn't take much to complete if I got my sewing machine and serger tuned up. Hey DebH, all hope is not lost. In addition to the quilt I just mentioned, I have a landscape about cowboys on the range chasing cattle that I gave up on when I misplaced one stitch a third of the way through and got tired of trying to line everything up after that. I also have a cotton shell I was knitting to enter in the Russell Fair - I always make things better if I know someone else will see it - but working with cotton wasn't like wool and I couldn't keep my stitches even. That's still waiting. Ditto for a pair of gloves I was attempting to knit but the yarn was too think and it wasn't working out. Oh, and I'm sure I have a half-finished afghan somewhere. The good thing is, I've completed 3 or 4 things for every one thing I've set aside. I'm sure you have too, except you craft on a keyboard. And in today's world, there's no need to make a full size quilt. Baby quilts and wall hangings don't take as much time and are great gifts as well as small items to tuck away for the future. I think after spending your day at work, you go home and spend your day with Nathaniel and that's the best thing you can do for him and you. Crafting can wait. Little boys grow so fast, you don't want to miss any more time with him than you have to. You're a terrific mom, Deb. You're doing great. Yep, someday DeAnna. I was hoping you didn't mind me taking photos from your website and altering them. And it just dawned on me this morning that I put 'Cats and Quilts' in the title, so giving hints was kind of over the top, eh. Haha. But it was fun to do. Oh, thanks. I forgot to mention all the cross-stitch projects I haven't even started. I have another mermaid I have started, but it's maybe 1/8 done and I haven't touched it in at least a year. I need two or three more lifetimes to finish all that! Aha - so now I know you wouldn't blink twice if I showed you all my 2 cubic ft moving boxes filled with fabrics I have intentions of quilting/creating with. There's probably 6 of them. Regardless of what Nelson says, I'm sure there's only 6. Well, maybe 7. And a half. Definitely no more. Honestly. I love your grandma's mirror. It's a lovely treasure. I sure would like to get my hands on that fishing quilt. I love it! Very clever, DeAnna. Anita, this was a fun post! DeAnna, have you read the cat/quilt books by Leeanne Sweeney? They are fun! Thanks, Suzie! I saw that "Cat Fish" material in the shop and just HAD to have it. It's really cute! And, no, I haven't read those, but I'll have to check them out. Thanks! Oh, I meant to mention, Suzie, that the backing fabric on the "Cat Fish" quilt is those same cats swimming around with their snorkels and fins. It's darling! DeAnna, I've gotten rid of a lot of my fabric. I used to work at JoAnn Fabrics (It's like an alcoholic working in a bar). Nice chat today, ladies! Loved the photos. She's a widow with three cats who makes quilts for the animal shelter. She always ends up caring for the cats of murder victims. Delightful series. I don't quilt, but I'd love to have some of that catfish fabric. It's too clever! I love this post! Beautiful photos. I love seeing the pics of DeAnna's handiwork--I would love to have her skill! I could never work in a fabric store. Knowledge is there, lost my will power. She always ends up caring for the cats of murder victims. Delightful series. Lovely post and beautiful quilts. I love looking at quilts, but decided that I didn't have the patience to make my own. I've gone as far as throw pillows. I love that DeAnna has taken quite a bit of creative license in hers, and not stuck to a strict pattern. So unique. Whimsical and fun! Barb, you know know your limits and stick to 'em. Good stuff. Yes, I like that about DeAnna's quilts, too. And the way she creates one with the receiver's tastes in mind. Very intuitive. I did notice that some were pieced and others appliqued. I wonder, DeAnna, have you tried the 3-D landscape quilts? I've been seeing them at the local fairs and they look so difficult. I love cozy mysteries and stories with crafts in them. Key in the Attic looks delightful!